MARIETTA, Ga. (CNS) — Before the afternoon rush at Chattooga Gymnastics and Dance school in Marietta, rhythmic gymnast Lani DeMello recently took advantage of a lull to work on perfecting a new rope routine. With years of ballet training, DeMello’s footwork is flawless and graceful. She is focused on mastering the required elements of the routine, including skipping, rope rotations and throws. DeMello, a parishioner of Holy Trinity Church in Peachtree City, was the 2015 World Champion in Rhythmic Gymnastics for the Down Syndrome International Gymnastics Organization. At the invitational championship, held in Mortara, Italy, Nov. 13-15, DeMello competed against more than 20 athletes from the United States and other nations. She won gold medals for her ball and club routines and silver medals for the routines using the hoop and ribbon. 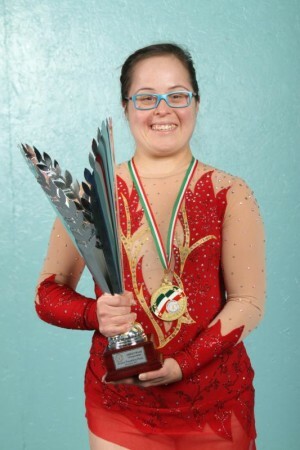 DeMello’s overall score, based on meeting technical required elements, earned her the title of world champion. She won a gold medal at the same organization’s World Championship in 2011 for a ball routine. “Hoop is the hardest,” said DeMello about the routines. In future competitions, she is replacing hoop with the rope. “It’s nice and quiet,” she said during practice in an interview with The Georgia Bulletin, Atlanta’s archdiocesan newspaper. By all accounts, she’s just as comfortable performing in front of a crowd as in an empty gym. The only child of Ana and Donald DeMello, she began taking dance lessons at 4. A family friend suggested Special Olympics and rhythmic gymnastics, which is a combination of dance, gymnastics and manipulation of various apparatus. She has been competing in rhythmic gymnastics since she was 13. Now 30, DeMello has participated in Special Olympics at the state and regional level as well as the program’s World Summer Games, earning numerous awards along the way. DeMello was an intern for her coach Cindy Bickman, a technical delegate, for the 2015 Special Olympics World Summer Games in Los Angeles. DeMello coaches other athletes, both typical and special needs, and competes against non-special needs competitors in other programs. DeMello’s father drives her to the school to train twice a week and on weekends from their Peachtree City home. In addition to Down syndrome, the DeMellos’ daughter was born with a heart defect and had poor muscle tone, problems often associated with the condition. In her coaching role, Bickman traveled to Italy for the World Championship. She said DeMello has natural ability and flexibility but has had to work very hard to develop muscles through core strength training and with jump work for rhythmic gymnastics. When a correction is needed, DeMello makes it. The only flash of frustration or temper comes from the pressure she places on herself to be excellent, said Burgess. This memory helps her not only to learn the choreography, but also to explain routines to students in ways they can understand. The DeMellos travel with their daughter, and Ana regularly helps behind the scenes with other competitors. Lani DeMello remarked that she’s often out of town for her July 10 birthday, having spent them at gymnastic venues in Finland, South Africa and Austria. The DeMellos were excited to see their daughter climb the podium to receive her World Champion trophy. A teary-eyed Lani was overwhelmed by the moment as America’s national anthem was played. “It was so, so amazing,” said Lani. Ana DeMello is grateful for all the connections made over the years with other families, coaches, and this unexpected doorway to new experiences for her daughter. Just as she was finishing high school, her parents were wondering what was next. That’s when the opportunity to travel outside Georgia to compete came about, and gymnastics became an even bigger part of DeMello’s life. “I’ve said this to everybody: God works in mysterious ways,” said DeMello.